Being sick last week gave me a bunch of time to catch up on TV. Normally I don't just sit and watch TV passively, it takes a really good show to get me to sit down and watch, but resting while sick is the perfect TV watching opportunity. 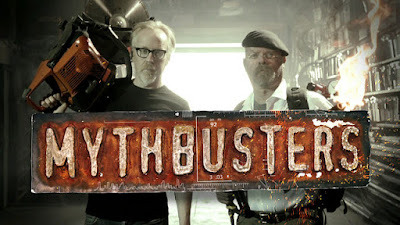 The announcement last week that Mythbusters is cancelled and their final season will air next year reminded me that I hadn't watched last season yet. So, I marathoned it. It was a really good season. It's a return to form for the Mythbusters. Instead of having five people in two teams doing five or six myths per episode this season just has Jamie and Adam. Typically they do two or three myths in an episode. It's much more like the early seasons of the show. I love that they take the time to actually walk through the process of trial and error again. In the most recent seasons it seems like they always jump to full scale and going over the top. In this season there's a lot more about the process of testing everything out along the way. My favorite episode was one where they tested the Myth that the U2 plane is the most difficult plane to fly. It was awesome because it wasn't actually like a myth at all. It was Adam and Jamie geeking out over how cool the U2 plane is. Then they got to train for it and actually experience the near-space flight. Adam's energy in the episode is especially contagious. It makes me realize that I'm ok with Mythbusters ending. They both seem to have outgrown the current formula for the show. It sounds like Jamie is done with TV and public appearances. In interviews it seems like he wants to move on to more private projects. And I'm ok with that. Adam has always been the driving force in the show while Jamie is the straight man. I love watching Adam geek out over things he's excited for and this seems like it will free him up to do more interesting work outside of the Mythbuster formula. I already listen to his podcast and watch some of his side videos on tested.com so I hope he takes a well deserved break and then throws himself into whatever he's passionate about next. That being said, after watching the 2015 season I'm now really excited to see how they send the show off next year. It'll probably be with a bang.